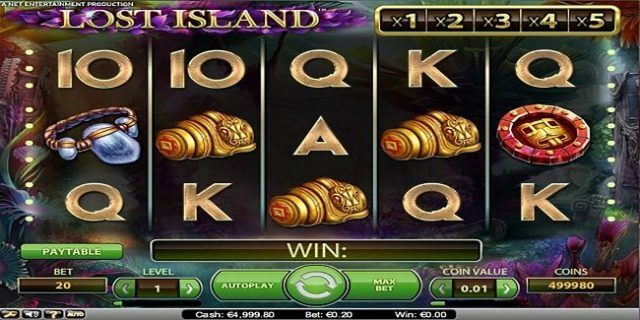 Lost Island is 20 paylines and 5 reels video slot game powered by NetEnt software platform. Coins per line for the game ranges from 1 to 10, and coin sizes from 0.01 to 0.5 per spin. The slot offers a jackpot of 500 times of your bet, while return of the player is 96.5%. The Purple Flower symbol is the wild card here, which can be substitute for all other symbols and can appears at any place, whereas the Jewel symbol is the scatter symbol in this game. Players like you can test this slot game at any NetEnt casinos for real money or for free. Below are some listed sites which offer this slot as well. Before setting the reels in motion, you should adjust level and coin value. The option “Level” is used to set the best level, “Coin value” is used to choose the preferred coin size and “Spin” option is used to starting the reels in motion at the selected wager. Two more options are “Max Bet” and “Auto Play” whch are used to spin the reels using the highest available bet and to turn the reels for a preset number of times without interruption respectively. If 1 wild symbol lands on any active reels, then a multiplier of 1×1 is activated, whereas total multiplier value equals to x5. A player will trigger 10 free spin if getting 3 or more scatter symbols, while 4 scatters will give him 20 free spins ad 5 scatter symbols on active reels will provide 30 free spins to a player. Additional free spins can be triggered during these free spins.